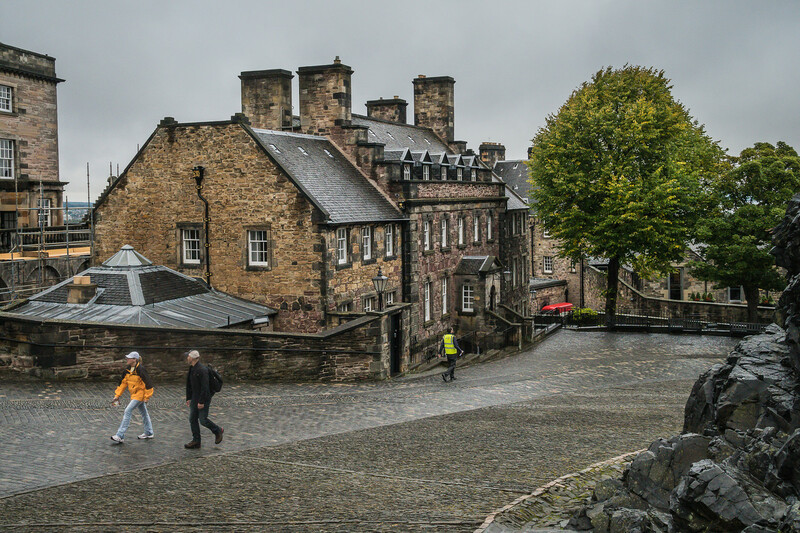 When I considered going to Scotland to visit its castles, I knew of only one—Edinburgh Castle. How fitting that I saved it for last. 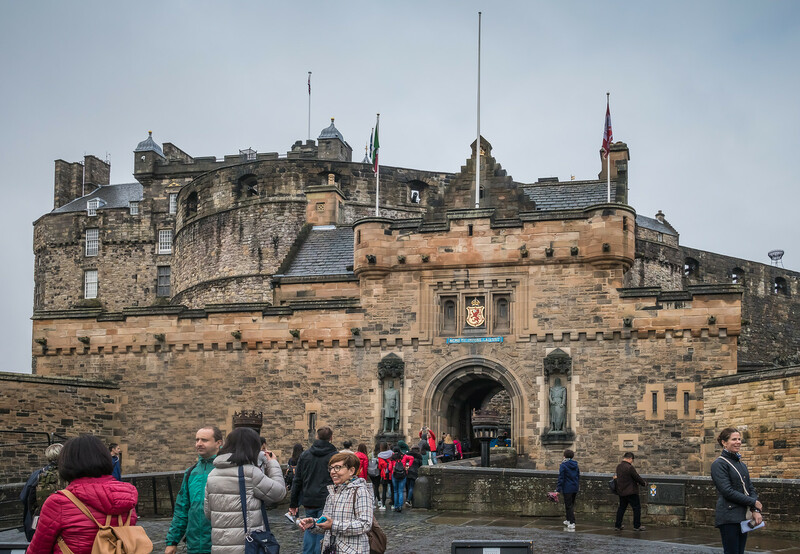 My tour group came up the Royal Mile to see this magnificent structure that towers above the city. It was a rainy morning and there were still many visitors arriving! 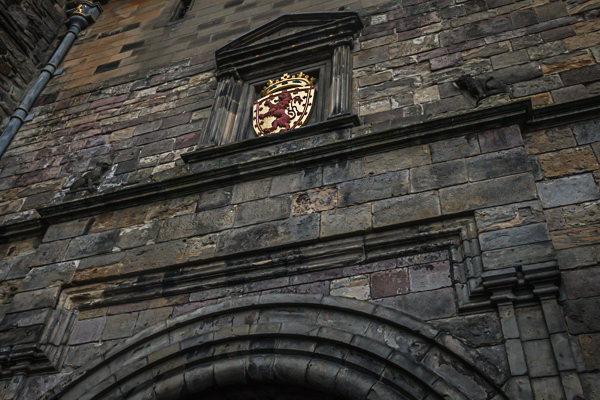 The statutes in the niches next to the archway are of Robert the Bruce and William Wallace (left to right). These were added to the gatehouse in the early twentieth century. The castle is a symbol of Scotland and it’s only fitting that these two heroes have a place in it. The castle sits on a volcanic hill. One can see the shiny black rock when driving along the road on the west side of the structure. The link will illustrate this. Fortunately, one can find outcroppings of rock inside as well. In the above image, one can just see some of this volcanic rock in the lower right-hand corner. You’ll also notice that the area is very hilly! Be prepared for climbing. There are several must-see buildings. The Royal Palace, the War Memorial, and St. Margaret’s Chapel. I chose the latter. It’s the oldest building here, dating back to the 12th century. Much of the original building has disappeared but some of it still remains. It’s a tiny place and when tourists crowd into it, photographing the interior is nearly impossible. Not far from the Chapel is the Half Moon Battery with its display of cannons. The most famous of these is Mons Meg. 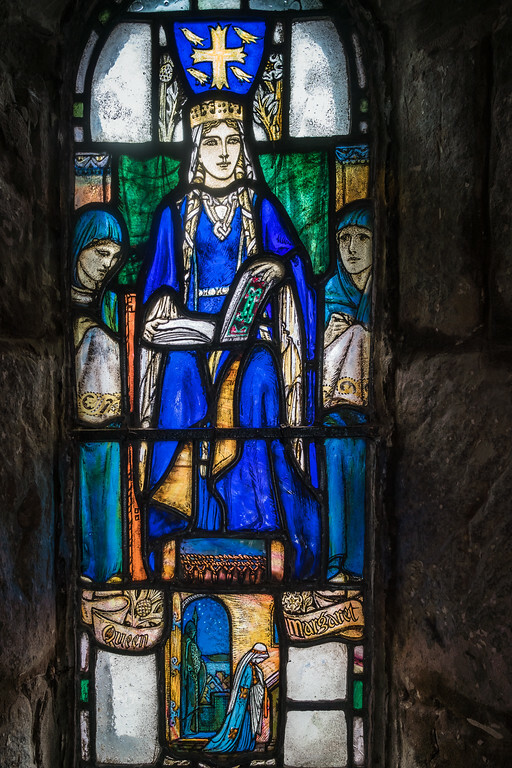 Have I mentioned that weapons are important in Scottish history? Castles and war just go together. 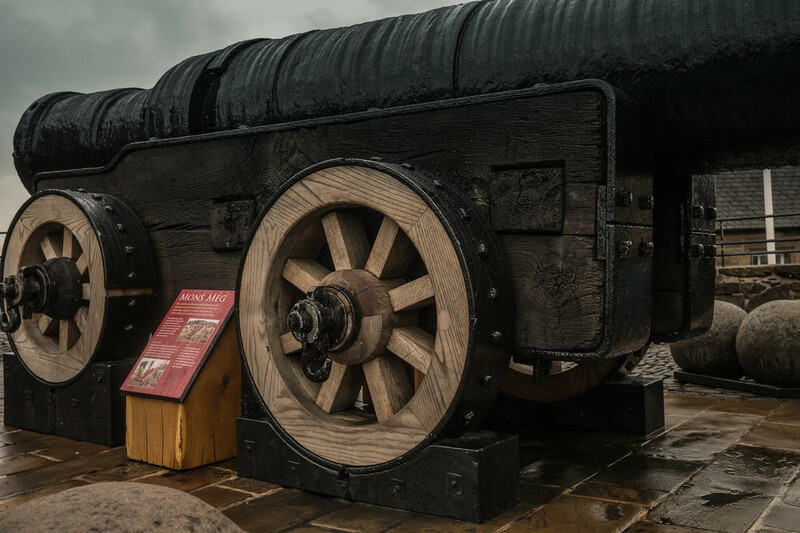 Mons Meg was a massive gun which could fire a 300-pound ball a distance of two miles. I wasn’t too interested in the firepower of this gun, but I did like the textures of the wheels and the barrel. You can see some very large cannonballs nearby. I don’t think I would like to be a gunner. It looks like very hard work, and dangerous. Mons Meg was retired permanently when the barrel burst during a ceremonial firing in 1680. Now she graces the battery overlooking the city. It’s a great view. Rather than join the queue to see the Crown Jewels, I wandered about. I just enjoyed prowling around the grounds. The architecture was marvelous. There were so many hidden views. I was tempted and certainly attracted by those curving lines leading down to who knows what. Alas, time was short and I didn’t go all the way to the Prisons. Instead, I turned back toward the National War Museum of Scotland. I didn’t have time to fully explore it but I did look at a few exhibits. If you feel confused by all the names, it’s no wonder. There’s another building here with a similar name. It’s the War Memorial. One thing I’ve learned on this trip is that if I think a venue will take a couple of hours to view, I had better set aside a day. 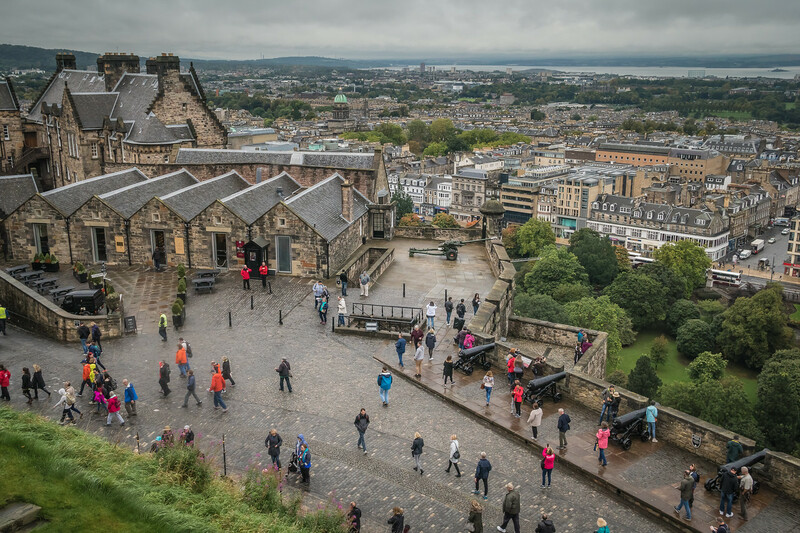 Scotland is filled with history…and castles. The next time I visit I will take more time and go at a slower pace. I’ll start with Edinburgh Castle! 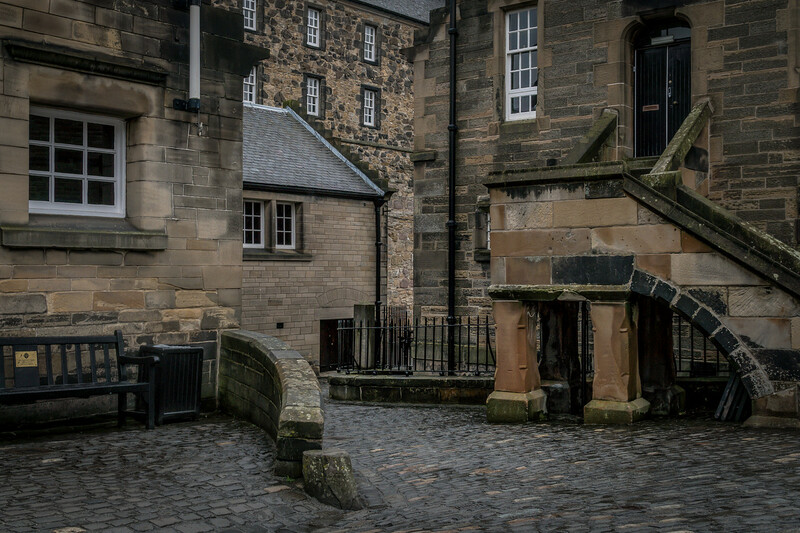 To see a few more images from my time at this castle, please click here.